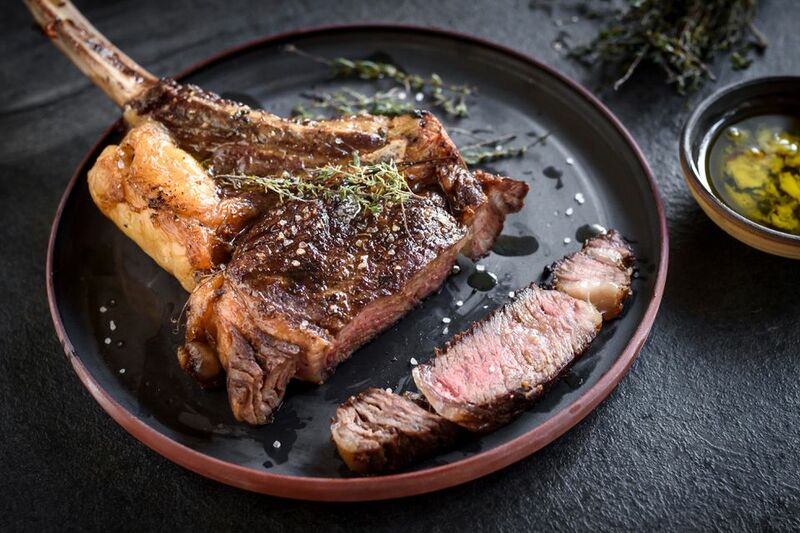 If ever there was a steak that resembled cave-man food, it would be the tomahawk rib-eye. Also called a cowboy steak, the tomahawk is cut from between the 6th and 12th rib of the beef cow and weighs between 30 and 45 ounces. It's a bone-in rib-eye, and the bone is Frenched to give the steak its distinctive "handle." The tomahawk steak is best pan-seared and then finished in the oven. Just before the steak rests, it is basted with butter, roasted garlic and fresh thyme to result in a juicy and flavorful piece of meat. Pat the tomahawk steak dry with paper towels. Season very liberally with kosher salt and freshly ground pepper. Let the steak come to room temperature. Meanwhile, prepare the garlic. Trim off the top 1/4-inch of the garlic head. Drizzle with olive oil, then wrap in a foil tent, and roast the garlic 30 minutes, until the cloves are soft. Remove from the oven and allow to cool. Moisten a paper towel and wrap it around the steak's rib bone, then wrap aluminum foil around the moistened paper towel. In a heavy skillet or oven-proof pan, heat the 2 tablespoons olive oil over high heat until it's just starting to smoke. Lay the tomahawk steak into the skillet and sear 1 minute. (Step back a bit since it will smoke and spatter.) Lower the heat to medium-high and cook the steak 5 minutes, without touching it. Using tongs and the bone as a handle, turn the steak over and cook another 3 minutes. Transfer the steak to a baking sheet and place in the oven, roasting 10 minutes. Use an instant-read thermometer to measure the steak's internal temperature--125 F for medium rare, 135 F for medium. The meat will continue to cook while it rests and increase by 5 to 10 degrees. While the steak is cooking, add the butter to the skillet and melt over medium heat. Squeeze the roasted garlic cloves into the butter, stirring with a wooden spoon to distribute, then add the thyme sprigs. When the steak is ready, take it out of the oven, and transfer it back into the skillet. Use a spoon to baste the butter and garlic over the steak. Turn the steak, and baste again. Transfer the steak to a cutting board, tent it with foil and let it rest 10 minutes. If you've wrapped the bone in the optional paper towel and foil, remove it now. Carve the steak, then drizzle with more of the butter and garlic. Or, if the steak is for one person, simply spoon the butter and garlic over the steak and serve.